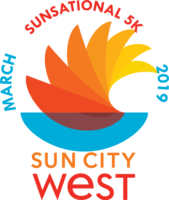 Join Sun City West for their Sunsational 5K Run/Walk on Sunday, March 10, 2019 at Stardust Golf Course. Awards will be given in age groups starting at 40 years old and up. Registered participants will receive T-Shirts, medals, race bibs, timing chips, race results, and post-race snacks. Proceeds will be donated to the Arizona Humane Society. Race Day Registration will be available beginning at 7:00am at Stardust Golf Course (map). Cost of registration on race day will be $40. Please park in the 128th Ave. Parking Lot. Shuttles will take runners to the start line beginning at 7:15am. The last shuttle will leave at 7:45am. Shuttles will take runners from the finish line/event area back to their vehicles following the event. Custom Finisher's Medal for all participants. 39 and under, 40-44, 45-49, 50-54, 55-59, 60-64, 65-69, 70-74, 75-79, 80-84, 85 and over. Saturday, March 9, 2019 at Stardust Golf Course from 3-4pm. Stardust Golf Course is located at 12702 Stardust Blvd, Sun City West AZ 85375 (map).